Cook your own Paella at home, by choosing one of the techniques for cooking the famous dish. On special occasions, 18th century Valencians used paelleras to cook rice in the open air of their orchards near lake Albufera. Marsh rat was one of the main ingredients of early paellas, along with eel and butter beans. Novelist Vicente Blasco Ibáñez described the Valencian custom of eating marsh rats in Cañas y barro, a realist account about life among the fishermen peasants near lake Albufera. Living standards rose with the sociological changes of the late 19th century in Spain, giving rise to reunions and outings in the countryside. By then the original ingredients were replaced by rabbit, chicken, duck, seafood and sometimes snails. This dish became so popular that in 1840 a local Spanish newspaper first used the phrase paella to refer to the recipe rather than the pan. The most widely used ingredient list of this era was as follows: shortgrain white rice, chicken, rabbit, snails (optional), duck (optional), butter beans, great northern beans, runner beans, artichoke (a substitute for runner beans in the winter), tomatoes, fresh rosemary, sweet paprika, saffron, garlic (optional), salt, olive oil and water. (Poorer Valencians, however, sometimes used nothing more than snails for meat.) It's these ingredients, and only these, that Valencians insist go into making modern Valencian paella. Valencian paella is never braised in oil, as pilau, though the paella made further southwest of Valencia often is. 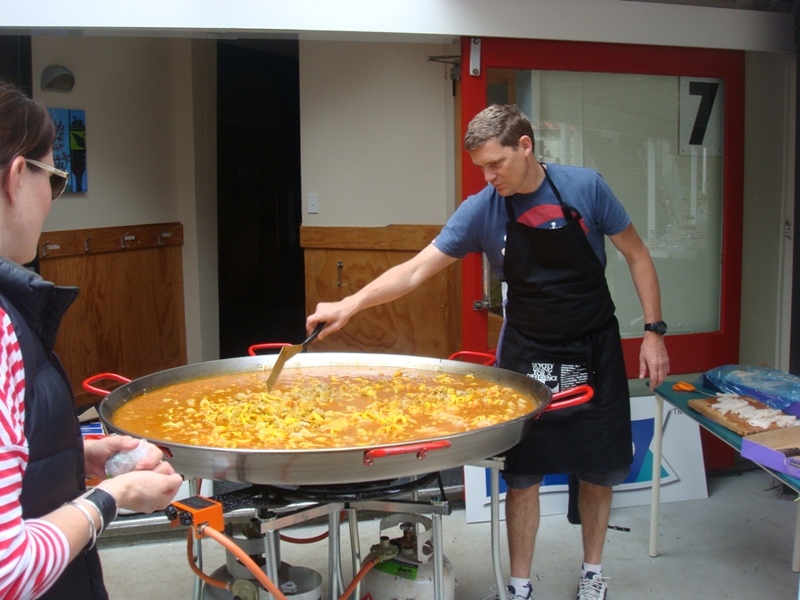 Coastal residents substituted seafood for meat and beans, thereby inventing seafood paella. Later, Spaniards mixed seafood into the original Valencian recipe and mixed paella was born. In Spain, mixed paella is very popular. Some restaurants in Spain (and many in the United States) that serve this mixed version, refer to it as Valencian paella but Valencians insist only the original Valencian recipe can bear the name paella valenciana. Seafood paella recipes for this dish vary somewhat, even in Valencia. Paella is now an international dish with recipes that include ingredients very different from its original versions in Valencia. There is a movement gaining speed throughout Spain which mandates that all Paellas have chicken drumsticks, not breast meat. Paella usually has a layer of toasted rice at the bottom of the pan. This is considered a delicacy in Spain and is essential to a good paella. The toasted rice develops on its own if the paella is cooked over a burner or open fire. If cooked in an oven, however, it will not. To correct this, place the paellera on a burner with a high flame while listening to the rice toast at the bottom of the pan. Then, remove it from the heat once the aroma of toasted rice wafts upwards. The paella then must sit for about five minutes before serving to absorb whatever broth remains in the rice.